I was hopefully making my way in. Unfortunately, Keith was getting restless at his place because I couldn’t find anywhere else to stay that didn’t cost a fortune. So he helped to get me in a more stable environment through a mate of his. I think his girlfriend wasn’t happy about the living situation. Actually, I was still sleeping on a sofa, but a longer and softer one. This was on N. San Vicente Blvd, West Hollywood, just around the corner from the Whisky A-Go-Go. Perfect! Keith’s mate Roy, who I’m now staying with, at a small cost, is one of the owners of The Central. On Tuesday nights, they have jam night at the Central; name after name visits the club to show off their talents – Peter Banks (ex-Yes Lead Guitarist), some of Santana, Linda Lewis, Ian Wallace and countless others. I became a good friends with Peter Banks and also Mitch Mitchell (Jimi Hendrix’s Drummer). 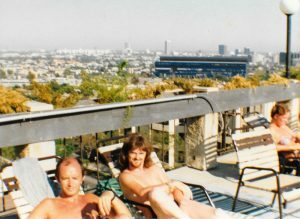 Peter lived just a few streets away, in 900 Hammond Ave, W. Hollywood and I use to hang out with him on the roof of his apartment, with a jacuzzi, a pool, and a tennis court. He taught me quite a few musical things, but he used to talk about Yes a lot, especially as he was told to leave, to be replaced by Steve Howe. He wasn’t a happy bunny. Peter went on to form ‘Flash’, also a good band and Ray Bennett, (Flash’s Bass player), would often come over too. Peter and I were writing together from time to time and he told me of an occasion when he was about to release a new band called Empire, of which an album had been completed and was ready for the company who signed him. This was just before Christmas. The company had given Peter and his new line up all the equipment needed to rehearse the album. But on return to the rehearsal rooms, Peter found all the equipment gone – the rooms were empty. He later found out that the Company had got cold feet and decided not to go ahead with the album release. He had a cassette in his apartment of the whole album and let me listen to it. I told him that I liked 3 of the new songs. Later that evening, Peter actually gave me the Empire Cassette. I never saw Pete take any other drug other than marijuana. It was so readily available anywhere in L.A. Along with speed, coke, black beauty and so on. I have never smoked anything in my whole life, because I hate the smell of tobacco, so I wouldn’t try marijuana either. But there were many friends that I had made, while in L.A, who were all on something. It did not take long for me to know who was on what. I could tell by the smell coming from their pores, or from looking at the pupils of their eyes. I tried on many occasions to help some of them give it up, but I realized it was to no avail. Meanwhile, Arrow started to make videos and write song after song. We were all writing together now. In anything, the more you work at something, the better it gets. Finally, Garry our drummer, who was working daytime for a great guy named Sol who owned a Jeweller shop somewhere in Bel-Air, had a brother who was an Entertainers Attorney, who knew Joel Coen, of Kudo 111 Management Inc – Manager of stars David Soul, Steppenwolf, and the Doobie Bros, and he told him about us (Arrow).